Allergy friendly comfort foods can be hard to find. I hate to say it but I think even harder to find in America. Why? Well, for me personally, many of my “comfort foods” growing up incorporated a “cream of something” soup. You don’t find that in Italian comfort food, or French comfort food, or Mexican comfort food. It’s winter, it’s cold, and I want MORE comfort food! Because of that, I’m reaching out to other countries and learning how I can modify their comfort food recipes for myself. Which means, making them gluten free, dairy free (optional), soy free, nut free and legume (pea) free. 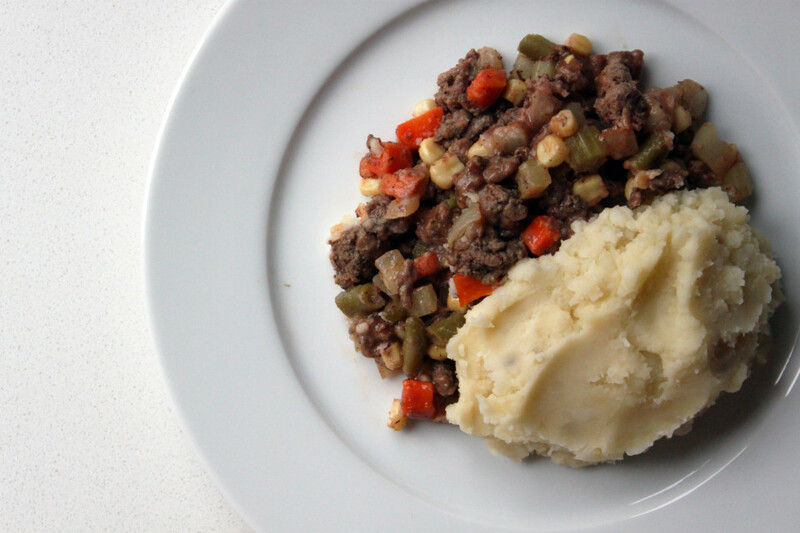 This shepherd’s pie is easy to make, and easily modified to be allergy friendly. It is a creation of my own made by reading a ton of different recipes and combining bits and pieces of each, I’ve made it a few different times, this time was my husband’s favorite (so luckily I jotted down the recipe). 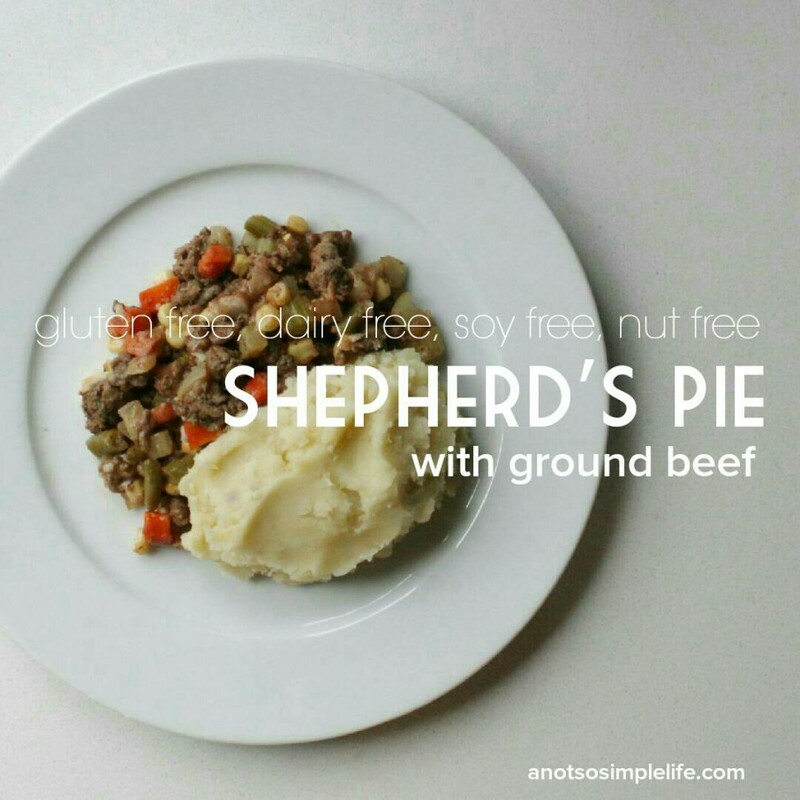 This gluten free, dairy free (optional), soy free, nut free and egg free recipe for shepherd’s pie made with ground beef, kind of properly known as cottage pie (shepherd’s pie is made with ground lamb – well maybe). Want a brief history lesson? Ok, here’s one from Wikipedia – the term cottage pie has been in use since 1791. In early cook books, potato lined the bottom of the pan and also topped the dish which utilized any leftover meat. 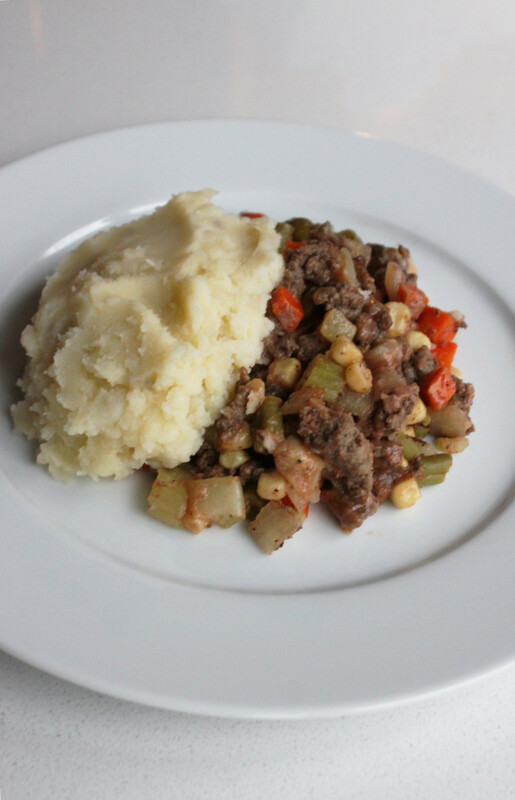 In 1877, the term shepherd’s pie emerged and, according to wiki, although it didn’t specify a specific type of meat. Shepherd’s only herd sheep, not cattle. So who really knows, perhaps they’re both the same thing (although I have heard people from England say that cottage pie is made with ground beef).